Joko Widowo, who will take office on Monday 20 October, has stated his intention to focus on the situation in West Papua during his mandate. He aims to improve healthcare and education first, reducing political tension, and to then deal with the causes of economic discrimination. While some Papuans welcome these promises and their first effects on the territory, others are sceptical due to similar promises made during his electoral campaign by outgoing President Susilo Bambang Yudhoyono, who then failed to act. In particular, critics stress the need for genuine and open dialogue, with the emphasis on political and democratic rights. Joko Widodo, who on Monday [20 October 2014] will be inaugurated as Indonesia's second directly elected president, will quickly move to salve the festering grievances of West Papua. Mr Joko, known as Jokowi, said his pragmatic policy and democratic, egalitarian approach could resolve the root causes of the country's last simmering separatist insurgency following the independence of East Timor and peace in Aceh. 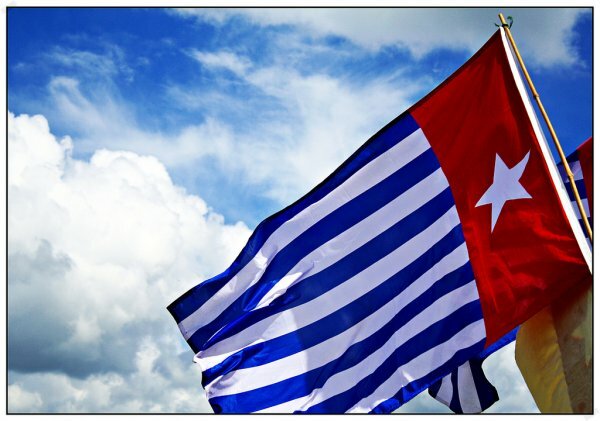 "I want to give special attention to West Papua," said Mr Joko in an exclusive interview with Fairfax Media, outlining a plan to resolve social and economic disadvantage first. If he succeeds where others have failed, he will be able to dismantle the last outpost of the Suharto-era security-based approach to Indonesia's internal politics and remove a major impediment to closer ties with Australia. Prime Minister Tony Abbott is due to arrive in Jakarta on Sunday night [19 October 2014] ahead of Monday's [20 October 2014] inauguration, which he will attend alongside regional leaders and the US Secretary of State, John Kerry. The new administration presents an opportunity for Mr Abbott to reset his "more Jakarta and less Geneva" election promise, after early intentions were derailed by fallout from revelations that Australia had spied on key members of the Indonesian elite, and the uncompromising "turn back" policy towards asylum seeker vessels. President Susilo Bambang Yudhoyono, who Mr Joko replaces on Monday [20 October 2014], made a similar pledge to fix Indonesia's easternmost province when he came to power a decade ago, but his money and good intentions were squandered by corruption, cronyism and bureaucratic dysfunction. Mr Yudhoyono was ultimately seen to be aloof and out of touch, whereas Mr Joko has pointedly immersed himself with practical, ground-level concerns. "Every day groups from Papua come here and I explain about the problem, they complain about the problem, so now I know 100 per cent of the problem in Papua," said Mr Joko, speaking in English, his third language. Citing the example of a bag of cement that costs $US6 in Jakarta but sells for as much $US150 in Papua, he said basic development objectives would be out of reach without attacking the causes of economic discrimination. But his first focus will be to deliver decent services in hospitals and schools. "I think the most important thing is education, yes, and then health care, and then infrastructure," Mr Joko said. "If we can deliver as soon as possible the education program, and health program, I'm sure, the political tension will drop." Some Papuan activists have welcomed Mr Joko as offering a genuine change, and hope of closer attention to their problems. Others, though, are suspicious of the economics-first approach. Reverend Socratez Yoman, the head of the Baptist church in Papua, said Mr Joko would fail unless he dealt directly with political concerns. "The core problem in West Papua is political," he said. "Before you talk about economic development, the first part has to be to have genuine and peaceful dialogue." As for the Australian government, Reverend Yoman said it needed to show more attention to the abuses in Papua and the demographic change that is seeing Papua's ethnic Melanesian population being outnumbered by migrants from other parts of the archipelago. "Australia needs to speak strongly," he said. Indonesia has been hypersensitive about the status of West Papua since 1969, when it annexed the province with an "act of free choice" that was seen by many international observers to be a sham. Many in the Indonesian elite still believe that Australia secretly supports the separatist movement and they commonly conflate criticism of human rights abuses with support for subversion. One critic of abuses in Papua, Greens senator Richard Di Natale, told Fairfax that Mr Joko's commitments were necessary but not sufficient to redress Papuan concerns. "While huge progress has been made in democratic reforms in the rest of Indonesia, West Papua remains a festering sore," he said. "I'm very encouraged that Jokowi appears to recognise that this is an issue that needs to be addressed [but] there also needs to be recognition of the democratic and political freedoms that have been denied for too long." Prominent Papuan woman, Frederika Korain, said people looked with hope towards Mr Joko because "he is not from the elite, has no political baggage". "In the last two weeks the tension has already reduced in Papua; I think the military troops there understand what kind of president he'll be," she said. The Indonesian president is the supreme commander of the military. She said a group of Papuan activists had suggested the Indonesian government set up an agency under presidential authority to focus solely on Papua with three parts to its charter: political dialogue, human rights and development.